And so it was with the Traveling Troubadours of Paniola Music — Gordon Freitas, Greg Sardinha and Ricardo Gonzalez — who came to Kaua’i a couple of days early both to immerse themselves in the Kaua’i rain (which they brought from O’ahu) and to share their music. On Saturday they played a few songs at the Waimea Town celebration (in the rain) and on Sunday they spent over an hour entertaining the long term care patients at Mahelona Medical Center in Kapa’a (in the thunder, lightning and rain). At one point the crack of the thunder was so LOUD that it sounded like the man up above had dropped his cast iron skillet on the roof of Mahelona . . . everyone visibly jumped! Good thing Gordon thought it was thunderous applause and upped his music and stories talking about Johnny Almeida, Ellison Onizuka’a Grandmother, history of the Parker Ranch, the vaqueros on the Big Island and more. It was quite an amazing hour to witness. For the most part, each patient was quietly taking it all in with slight side-to-side nods of their head, gently tapping one hand over the other, tapping their wheel chair footstool with stockinged feet, or keeping time with their head. One patient kept getting up and did her marching steps when they played “Kohala March” and switched to a definite hula sway when they played “Kaimana Hila”. One lady in the front row sang along on nearly every song, but when they played familiar old favorites like “Koko Ni Sachi Ari” and “You Were Always on My Mind,” many recognized the melodies and hummed along with joyful smiles on their faces. One of the staff dragged Ricardo off the stage and asked him to rhumba; you would think that someone with the last name Gonzalez was born dancing rhumba, but all he could do was try. It did not matter as the dancing patient kept cutting in so he had little time to figure out the steps. They added an extra fifteen minutes of music because it took that long for the staff to push each wheel-chaired patient back to their rooms; the three played until the last patient left the room. What great guys! When the Rodeo Comes to Town the Ladies Come Out of the Woodwork! One of the fun things about attending a GIAC event is that everyone really gets into the mood and so it was with the loyal volunteers at the EKK Monday. Carol Sue Ayala, Jodi Ascuena and Diane Wry give Gordon an unexpected boost to his ego and add their charm to greeting the guests at this joyful rodeo. The ukulele gang opened the evening showing their vigorous mexican style strumming as they sang Big Island and Paniola Yodel with the audience joining in on the “Ee da lay hee… Ee da lo ooh… Ee yo- da lay hee tee… Ee yo_ da lay hee tee…” every time Gordon waved his arm. Nani Kaua’i in a mellow nahenahe style, complete with the sweeping sounds of the steel guitar, conjured up nostalgia as four hula dancers and Aunty Bev Muraoka came up to hula. Even though dressed in jeans and tees, the dancers were reminiscent of swaying hula dancers with flowers in their hair under the swaying coconut trees . . . it’s the strains of romance that we associate with the steel guitar. The musicians launched into an evening of songs about and for the paniola and their cattle. I never knew there were so many songs in this genre but apparently the Local Folks music just touched the tip of the iceberg . . . or should I say saddlehorn. Paniola o ka Pakipika is a song about how the cowboys road their cows into the Pacific Ocean as described to Gordon by his paniola grandfather whose job was to rope and drag the cattle to the boat while chasing sharks away by slapping the water with fans. Through his compositions Gordon is writing the history of the Hawaiian paniola in song. Whether based on tall tales or true experience, the songs describe the unique experiences of the colorful cowboys in the westernmost frontier of America. Greg could switch up the tempo from graceful hula music to a lively cattle chasing beat, complete with the horse’s whinny…Uihaa! With lyrics like “Some day I’ll ride that painted pony down the mountain and into the sea,” these ballad-like songs tell stories so the lyrics are all important; if you don’t hear the lyrics, you miss the story. You can really hear every word Gordon is singing so it’s easy to follow the story. In addition, they repeat the same words over and over so if you don’t get it the first, second or third time, you can get it the fourth time. Gordon’s skill in songwriting is evident in this song written for his Grandfather. “Saddle City” in Waimanalo is a place where cowboys from all over the real western world of cowboys get together to compete for the title of “Jackpot Roping”. Another competition that took place many years ago inspired another beautiful song. “Cheyenne Waiomina,” or Wyoming, which sounds like a lovely girl’s name is also the site where the famous steer roping championship took place many years ago. The famous paniola Ikua Purdy and other Hawaiian cowboys with flowers in their hats and jangling spurs swept the competition winning first, third and sixth place in spite of the less-than-hospitable conditions they experienced from the rodeo organizers. It was a big thing for a Big Island boy to win the tour, and Gordon wrote a song that just wants to rub it in. Gordon shared a well-known song about Teddy Roosevelt’s “Rough Riders” cowboys. Greg’s steel guitar playing is truly outstanding in this song. Gordon pointed out that while he had the title of being Jerry Byrd’s worst student, Greg was positively influenced by Jerry Byrd and is today very active in perpetuating the instrument. 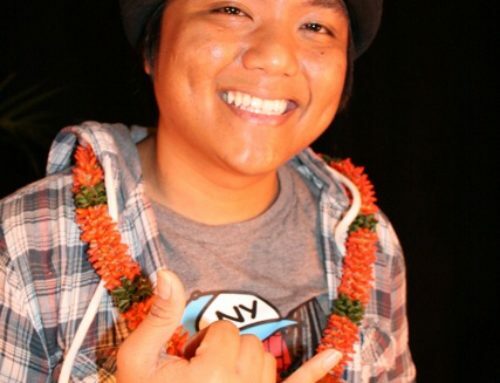 Easily one of the outstanding steel guitar players in the state, Greg was given a chance to shine in the instrumental “Ka Nahona Pili Kai” inspired by a Japanese melody. Kohala March is another song that shows off Greg’s virtuosity. Gordon and Ricardo, the bass player, have a long history as they served in the Navy for 20 years, but here they are years later playing music together. Although they never got to visit Koke’e in the pouring weekend rain, they decided to sing Ricardo’s favorite song Koke’e. Steel accompaniment takes me back to the days when Feet Rogers played the steel with the Sons of Hawai’i. Not only did the four young hula dancers race up to share their hula, but Gordon, who donates his lovely handcrafted purses to the weekly give-away package added his sensuous hula moves and had everyone exclaiming, “Where did he come from?” EKK is full of surprises. Hanohano Hanalei took us to the opposite end of Kaua’i and Paniola Country, made famous by Melveen Leed, takes us to Molokai where paniola history runs deep. Gordon is a prolific songwriter, and being a paniola at heart, many of his songs tell stories. Songs he shared included Local Folks, Standing in the Ua (rain), Sing Hawaiian Sing (the EKK song), Pineapple Road and Swept Away (about the Hilo Tidal Wave). Everyone on Kauai can relate to these songs during these weeks of relentless rains that are carving new trenches in the yard and piling tons of debris along the edge of these massive puddles). All too soon, the time was up and although the musician had gotten through only half of their play list, it was time to say adios and Gordon just had to sing the song for which he is well known. Hawaiian Cowboy started at fast speed and amped up verse after verse to fast, faster, fastest, and everyone who learned to yodel had their chance to join in on the yodeling. It’s really not as hard as it sounds….if you do a slow yodel….but Gordon is really the one who can yodel up a storm and bring the cattle safely home. I want to tip my cowgirl hat off to Gordon for being a true ambassador of music sharing his music from the heart. Write, Gorgon, Write . . . you have such an ability to capture island life and have so much more to share! 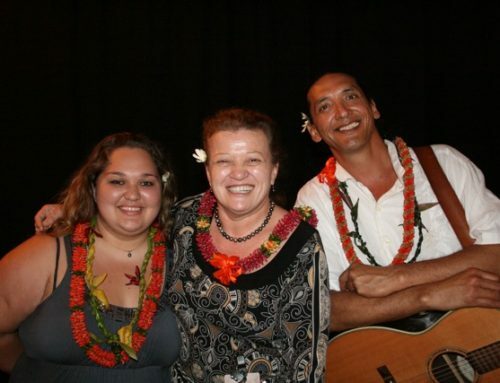 If you have never been invited to a Hawaiian-style party, this is your chance to hang out with one of Kaua’i’s Queen of Entertainment — Aunty Bev will make you sing, dance, laugh and just have a great time at her party.